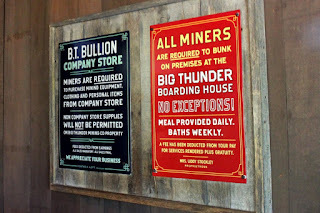 If you pay enough attention to the postings around the Big Thunder Mountain Mining Company, you know that the miners obviously get into town to blow off some steam every now and then just by the number of posters promoting local, shall we say, entertainment venues. However, I’m not quite sure how they even have the money to buy a brew or two. 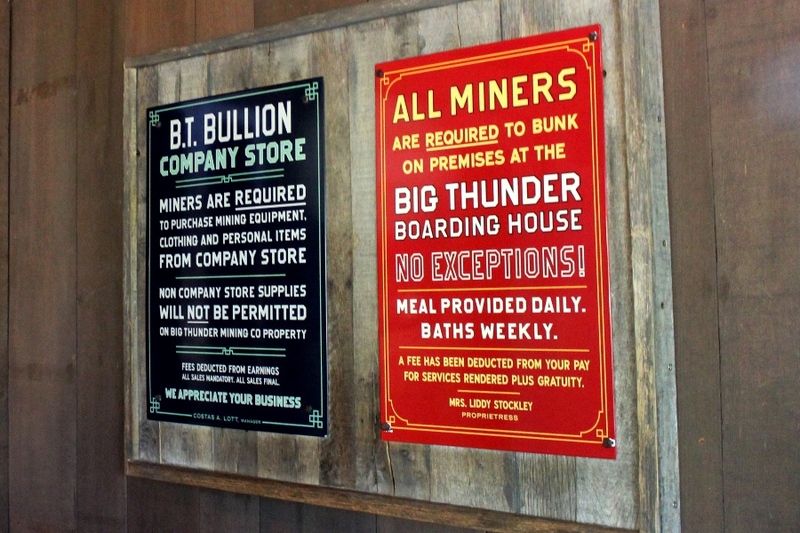 These two postings at the entrance make it very clear that miners can only use equipment that they purchase at the company store, and they are required to stay on premise for room and board. In fact they even take the cost right out of their checks ahead of time, and gratuity! It the Big Thunder Boarding House that I’d like to pay a little more attention to today. Let’s look at who is running the Big Thunder Boarding House. The Proprietress is listed as Mrs. Liddy Stockley. While the first name of Liddy is a new addition, you may recognize the name of Mrs. Stockley. As it turns out this isn’t her first attempt to rustle up some gold mining boarders. She was one of the citizens in the 1975 film, The Apple Dumpling Gang, to try and take in the gold nugget of the Bradley kids, I mean the gold nugget that was the Bradley kids! Yep, she and many of other citizens of Quake City were all too willing to take in Bobby, Clovis, and Celia once they had discovered the 300 pound gold nugget. Mrs. Stockley was played by Fran Ryan, a longtime character actress featured on shows like Gunsmoke, Green Acres, and The Doris Day Show. She was even featured as the voice of Camembert Kate in a 1990 episode of Chip ‘n’ Dale Rescue Rangers. In the end, the Bradley children stay with Donovan and his new bride, Dusty, and all’s well that ends well for The Apple Dumpling Gang. As for Mrs. Stockley, clearly one gold rush town wasn’t enough for her! She’s made her way to Tumbleweed and runs a respectful business in the town, even if the manner in which she gathers in her boarders is a bit compulsory. I wonder if Theodore and Amos have made their way into town too?